A simple, easy to apply bracing for patellar subluxation, dislocation, malalignment and instabilities. The Tru-Pull Wraparound brace, designed by Dr. John Fulkerson, incorporates his patented technology of independent straps, which provide a consistent pull on the patella. A choice of buttresses give the patient an option for more aggressive support. The Tru-Pull Wraparound is an ideal choice for patellar subluxation, dislocation, malalignment and instabilities. 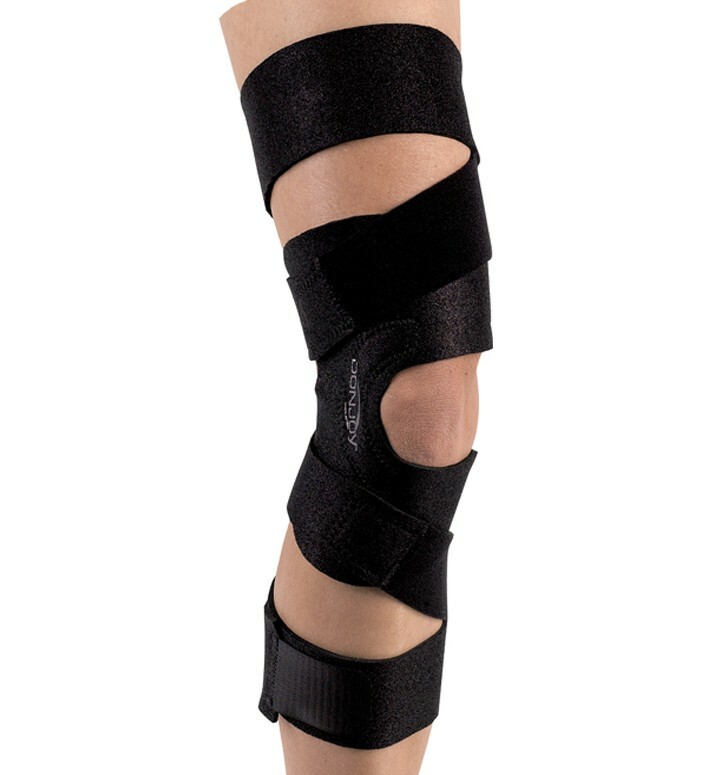 Patented bifurcated pull strap design allows for constant pull on patella. Choice of two adjustable thickness' of buttresses (1/4" and 3/8"). Wrap style design for ease of application and fit. Do you have a posterior view photo? I have the tru pull lite right now as given to me by my therapist and my biggest problem is that I cannot wear it over jeans etc during my day to day activities and I often experience pain just from sitting too long etc. It does work pretty well when I do taekwondo aside from the bit of loosening that I have felt recently and the fact that it sometimes shifts. I have two questions, first would the tru pull wraparound be good for me to wear to manage my daily pain/wearable over my jeans? And would the tru pull advanced be better for me when I do taekwondo since it offers more support? My main concern is that it will hinder my mobility as it is longer and has metal hinges rather than plastic. I have a partially torn patella tendon (through the middle of the tendon) and there is quite a bit of pain and discomfort when I walk. Would this brace help alleviate some of the pain? Also, I am not allowed to run yet, but would this be a good brace for when I can run? I have EDS Hypermobility, and my knees bend backwards a good 20-30 degrees. I play tenor saxophone in a college marching band. We frequently use a very rapid, aggressive high-knee marching technique and the instability in my knees make this dangerous and painful. I have not had any major ligament injuries yet but I would like to avoid one. Would this be a good brace to consider? If not, what would you recommend? Have had the braces for a few days. Choose these braces because of a recommendation from my ATC. PROS: When positioned correctly, they provide enough support to my patellas that I am able to do my rehab without pain. These braces do not restrict range of motion at all, which might be their best feature. Very adjustable. CONS: I find I have to adjust the braces frequently. If I did it over again, I might order the next size up for the extra strap length. This is a great brace that does what it needs to do without causing other problems. I've significant patella problems and am recovering from a knee arthroscopy and a lateral release. While the other Tru -Pull braces are nice, they did help with my problem, they also caused other problems. This simple wrap-around brace gives me just what I need without making other things hurt. Even hiking I don't feel the need to readjust the straps, though it might take a few times to adjust it properly. In the end, this design allows a truly custom brace. The "pull on" braces, quite simply, don't work for me. This one does! Following my dislocation, this was recommended to me by my physical therapists. As a collegiate athlete, it is important to be able to move and run without a hitch. This brace constantly needs to be adjusted following sprints or long runs. The Don Joy Tru Pull and Tru Pull Lite both provide more stability and less hassle.